The following is a review of Foot Spray with Peppermint Oil which is produced and distributed by Lafe’s Natural Body Care. This product claims to provide relief from itching as well as prevent odor caused by bacteria. Read on to learn whether or not this product is right for you and your symptoms. Natural mineral salts are a popular alternative to the chemicals used in many processed deodorants. Similarly to how you would use salt water to clean and prevent bacteria in a flesh wound, natural mineral salts prevent the growth of odor-causing bacteria. Natural mineral salts work as a preventative measure against odor. It is not caused by perspiration or sweat; it is actually caused by bacteria. Because of this, natural mineral salts are most effective if they are applied after you have showered. They will not cover up odor or kill bacteria once it has already grown. Aloe vera is a popular plant that is used to soothe the skin, ease the discomfort from rashes, irritations and burns. It is very commonly used in sun and after-sun care products and many people tout its moisturising and soothing properties. Peppermint oil is often used as a fragrance in soaps; however, some suggest that it is useful in relieving gastrointestinal symptoms like irritable bowel syndrome, nausea, vomiting and indigestion. This product claims to be free of alcohol and to be hypoallergenic. Lafe’s Natural Body Care do not test their products on animals. Several of the ingredients in this product are said to be certified organic. To use this product, you should spray it as needed on your feet. There are no listed side effects of natural mineral salts. They are said to be completely safe and suitable for use on children. This product does not contain any of the harmful chemicals that may be included in other deodorants or antiperspirants. People may experience heartburn after using peppermint oil. There are also possible allergic reactions to peppermint oil including headaches and flushing. There is not enough known about the safety of peppermint oil to recommend it to women who are pregnant or breastfeeding. 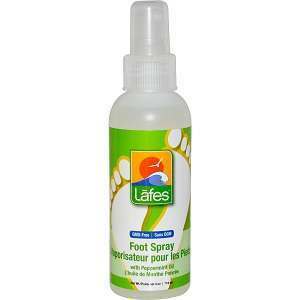 The retail price for Lafe’s Natural Body Care Foot Spray with Peppermint oil is listed at $4.79 for a 4-ounce bottle. This price is discounted from $5.99. If you buy this product in bulk you can receive a discount of 10%-15%. Lafe’s Natural Body Care offer a 100% satisfaction guarantee and will refund or exchange any purchase. They are a B Corp Certified company and the company donates one percent of the profits from every sale to breast cancer awareness. The Foot Spray with Peppermint Oil manufactured by Lafe’s Natural Body Care contains many of the most common ingredients in natural deodorants. It few or no side effects. However, some people may have issues with the peppermint oil. This product works as a deodorant but it is not clear how it will help treat fungal infections like athlete’s foot. Jimmy Rodriguez	reviewed Lafe's Natural Body Care Foot Spray	on June 11th	 and gave it a rating of 3.